Amazing British Columbia is now available in a bookstore near you! This natural history alphabet book about BC by Audrey Owen is written at a Grade Three level and is illustrated by wonderful photos from many photographers. This site offers links to supplement the material in the book. Click on a letter of the alphabet below to learn more about the entry in the book. You can see a photo of the photographer, read a short biography of the photographer, check the references Audrey used to write the book, see lists of other information on the topic, and see more photos. You can even add your own information. If you have a great learning idea you want to share with others, contact Audrey. If your local bookstore is not yet carrying Amazing British Columbia, send the owner to this site, or click the link to find out how to buy the book. Read the technical description about Amazing British Columbia: A Natural History From A to Z. Find a link to information about how the book was written. What would you like to know about Audrey Owen, author of Amazing British Columbia, the natural history alphabet book of BC? Audrey shares her story and answers your questions about her book. Praise for Amazing British Columiba: A Natural History from A to Z comes from librarians and educators. Alphabet books move from teaching letters to teaching so much more. See what this ABC book does. Stay up to date with the latest news about Amazing British Columbia, the natural history Alphabet book about BC. Sign up for Amazing BC News to learn when new items are added to the site, Amazing British Columbia. Stay up to date on BC's natural hisotry. Learn how to buy Amazing British Columbia: A Natural History From A To Z for yourself or your outlet. How many of the amazing British Columbia towns have you seen? How many have you heard of? Find them alphabetically and take a virtual tour of amazing BC. 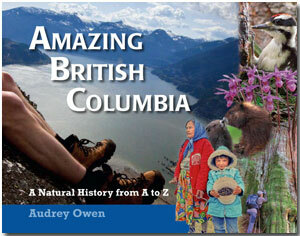 Contact Audrey Owen, author of Amazing British Columbia. The abc teacher resource page for Amazing British Columbia offers teacher-generated lessons for use with the natural history alphabet book available from the site.